Last week, a group of school kids visited our institute and I had the honourable task of introducing them to the world of sea ice. To this end, I prepared some experiments with ice cubes. They are really low-level to understand, but still you can explain a whole lot of phenomena with them. 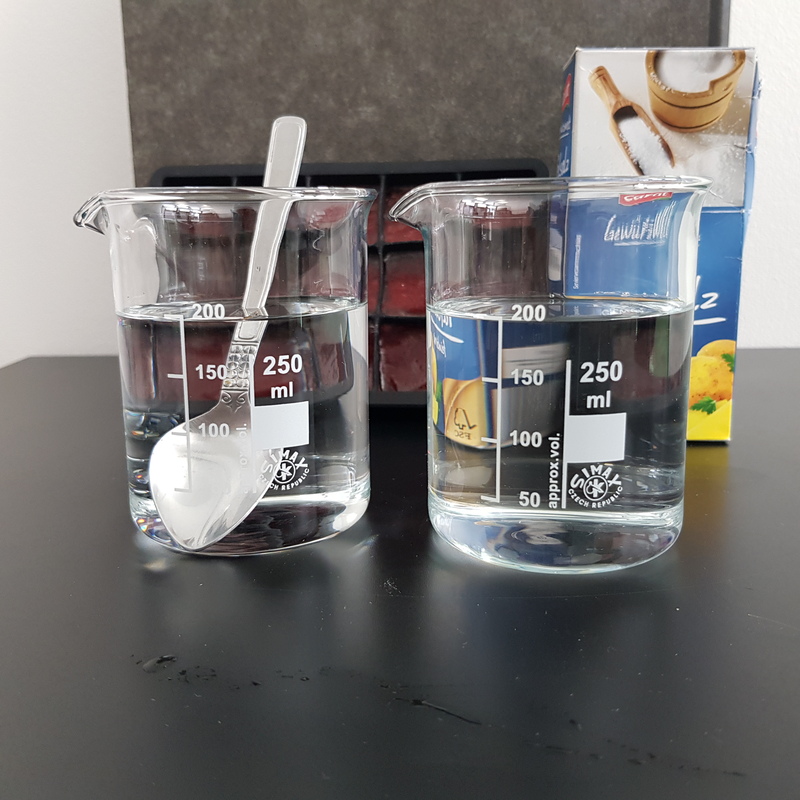 Since I had lots of fun preparing and conducting the experiments (and since it makes for an easy blog post as everything is prepared already), I want to start a short article series called ‘Fun with Ice’ (not to be confused with ‘Fun with Flags’!). The first part of the series describes the difference between salt water and fresh water (spoiler: it’s the salt that makes the difference). But what happens if you put an ice cube into a glass of fresh water and another one into a glass of salt water? Right. They melt. But which one melts faster? And what happens with the melt water from the ice cube? Now, first we need to mimic sea water. The salinity of the Arctic Ocean is about 30 ppt, meaning that 1000 g of water contain 30 g of salt. One tea spoon is about 5 g, so that you need 6 tea spoons full of salt to make one liter of Arctic sea water. Once this is done, you lay one of the ice cubes in each glass. Make sure to put it in there carefully, ideally with the tea spoon. 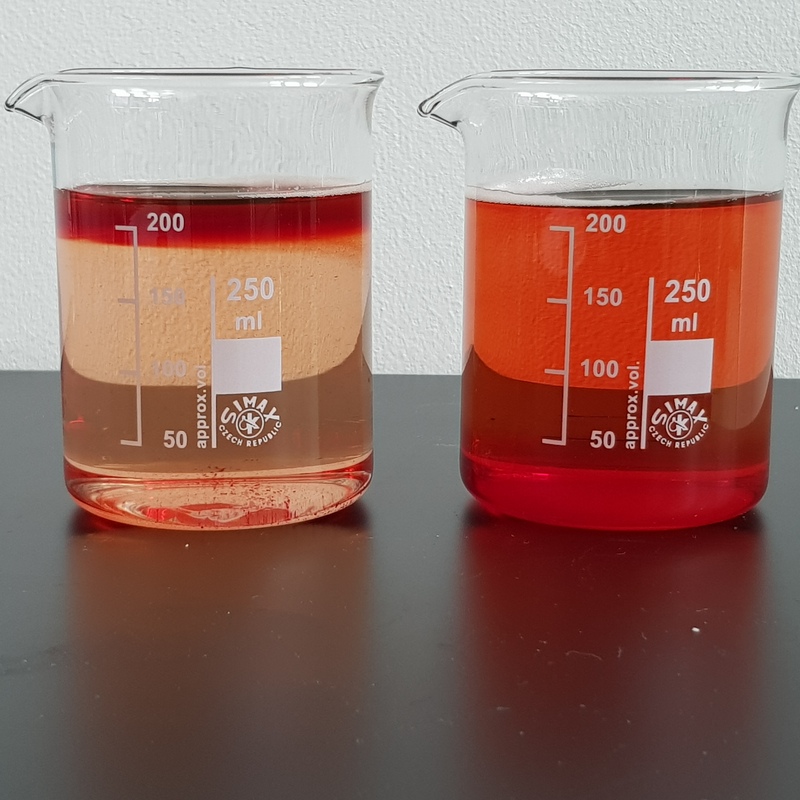 You should immediately see the difference between the saltwater glass and the fresh water glass: In the fresh water glass, you see streaks of coloured water sinking down to the bottom like in Figure 2. 3) Once the ice cubes have melted completely, one can still observe the distribution of the meltwater (coloured water): In the saltwater to the left, it stays at the surface. In the fresh water to the right, it has mixed with the water from the glass, so that the colour is homogeneously distributed. 2) The meltwater in the freshwater glass (to the right) sinks to the bottom in streaks because it is denser than the warmwater in the glass. The (fresh) meltwater in the saltwater glass is still less dense than the warm salt water. Therefore, it stays at the surface. In the salt water, you hardly see these streaks. Instead, the coloured water (this is the meltwater from the ice cube) stays at the surface. After some time, the fresh water is coloured homogeneously. 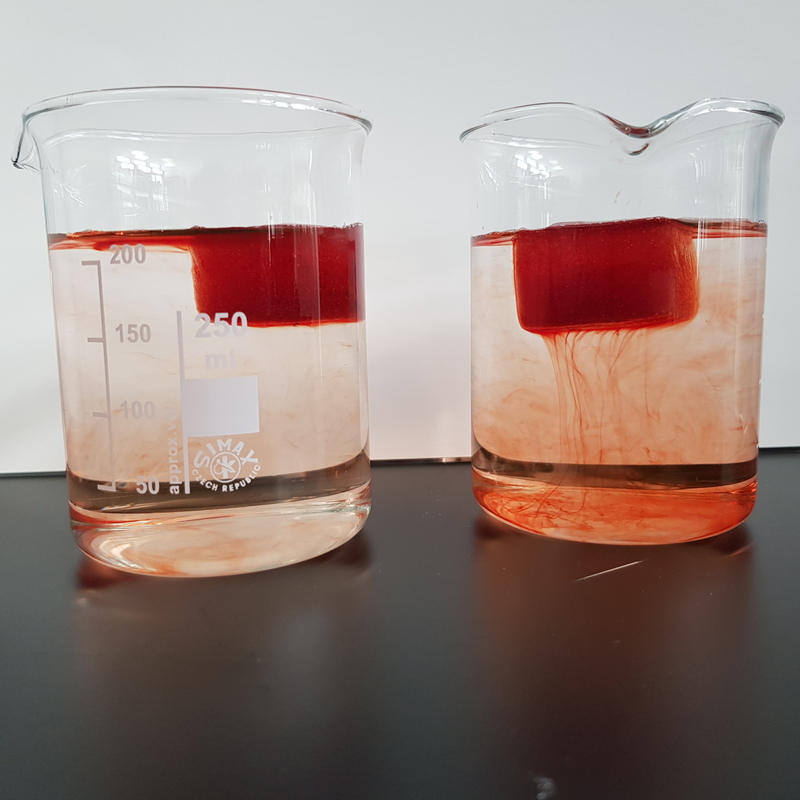 In the salt water, there is one layer at the surface which is dark red and the rest is still quite clear (Fig. 3). Also, the ice cube in the fresh water melts considerably faster. But why? What happens here is something we scientists call convection. The cold water from the ice cube is denser than the warm water in the glass. Therefore it sinks to the bottom. Those are the streaks which you see. But why does this not happen in the salt water glass? Well, temperature is not the only quantity which influences the density. Salinity also plays a role: Salt water is denser than fresh water. So, in the salt water we have two different types of water: Fresh and cold water (the melt water from the ice cube) on the one hand and warm and salty water on the other hand. You see that we have two competing effects here: Temperature tells us that the melt water from the ice cube should be denser. Salinity tells us that the water which is already in the glass should be denser. Since there is quite a lot of salt in the water, salinity wins the battle. Therefore, the salt water is denser and the melt water has to stay on top. That is the dark-red layer which you see on the top. So, with the concept of convection, we can explain the different distribution of the meltwater in the two glasses. Next, we can think about why the ice cube in fresh water melts faster. The reason is pretty simple: We saw that, in the fresh water glass, the cold meltwater sinks to the bottom. This means that the water which is already there has to go somewhere. Since it can’t go to the sides, it goes upwards. At the surface, it melts the ice cube, cools down, sinks back to the bottom and makes room for new warm water. There is a constant supply of warm water to melt the ice cube. In the salt water glass, the meltwater does not sink to the bottom, but stays at the surface. Therefore, the ice cube always lays in its own, cold meltwater and thus melts considerably more slowly than its brother in the fresh water glass. If you have a stem thermometer at hand, you can measure the temperature at the surface and bottom of both glasses and see if they match your expectations. This convection process does not only happen in our small ice lab, but plays a vital role in the climate system. Some examples? The continental drift is driven by convection: The Earth’s interior is really hot (as in really really hot, around 5400 °C). The Earth’s surface is cooler, thank God. This means that the magma in the Earth’s interior is heated from below and gets less dense, so it rises. Once at the surface, it replaces the comparably cold magma at the surface which sinks down because it is colder and thereby denser. Since the continental plates float in this magma, they are moved around by this process. The gulf stream is strengthened by convection: It carries warm and salty water from the tropics to the mid-latitudes. Here, it cools down and sinks to the bottom because it is saltier and thereby denser than the surrounding water. This drags more warm and salty water northwards like on a conveyor belt. At the coast, you can use convection to predict the wind throughout the day. The land warms faster than the sea. Therefore, in the morning, the air over the land warms faster than over the sea and rises upwards. It is replaced by air from the sea, so that the wind blows from the sea towards the land. In the evening, the situation is reversed: The air over the land cools down faster and sinks downwards. It pushes the air towards the sea, so that the wind now blows from the land towards the sea. And all this can be mimicked with 2 ice cubes, salt and some water. Pretty cool, isn’t it? The next part of this small series will be about the difference between sea ice (frozen sea water) and lake ice (frozen fresh water)…be prepared!